Russia may donate 50,000 tons of wheat to North Korea this year, a Russian lawmaker said during a meeting with DPRK ambassador to Moscow Kim Hyong Jun on Monday, as part of ongoing humanitarian assistance to the country and in response to the North’s continued food shortages. The meeting in Moscow also addressed North Korean illegal fishing in the waters off Russia’s Far East, joint economic projects, and the status of DPRK laborers in country’s territory, according to a Federation Council release and local media reports. “The Russian authorities are now considering the issue of supplying to the DPRK a donation of 50,000 tons of wheat for circulation in North Korea,” Chair of the Federation Council Committee on Foreign Affairs Konstantin Kosachev was quoted as having said by Russian state-operated RIA Novosti. 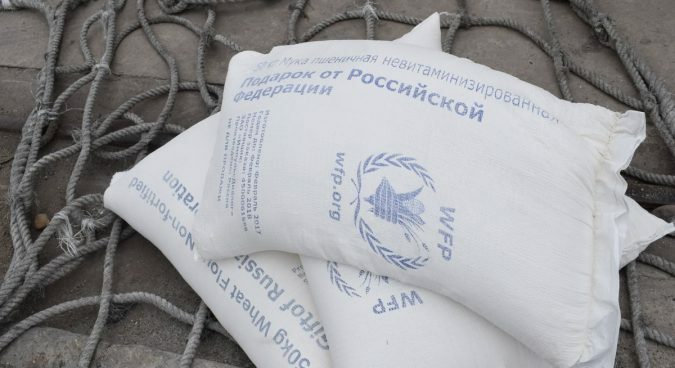 The report said Kosachev framed the planned aid as part of larger efforts to contribute to international assistance efforts, with the lawmaker promising Russia would fulfill its prior promises to provide millions of dollars to organizations such as the World Food Programme (WFP) for their work in the DPRK. Also during the meeting, the two sides discussed the “state of affairs in the field of North Korean labor migration and the fisheries sector,” an official report from the Federation Council of the Russian Federal Assembly said. A report from state-run TASS News Agency carried a quote from Kosachev on the matter, in which he said Russia “expects the DPRK will make a number of additional decisions” to alleviate complaints expressed by various Russian officials in recent months. “There is a certain debt that had accumulated last year for the catch of biological resources in the exclusive economic zone of Russia, and the ongoing actions of the Korean fishermen for illegal extraction of biological resources” near the Russian border, he said, according to TASS. Regarding North Korean laborers in Russia, the two sides discussed the present situation and how to move forward in light of UN sanctions requiring their return to the North by December 19 this year, RIA reported. Russia’s ambassador to the DPRK Alexander Matsegora also commented on the issue of laborers over the weekend, stressing in an interview with Interfax that his country is strictly abiding the sanctions, echoing recent comments from the labor minister. “In particular, the construction of a number of social facilities in the regions of Siberia and the Far East was suspended,” Matsegora said, adding Russia also lost business from the workers who tended to spend their earnings in local shops. 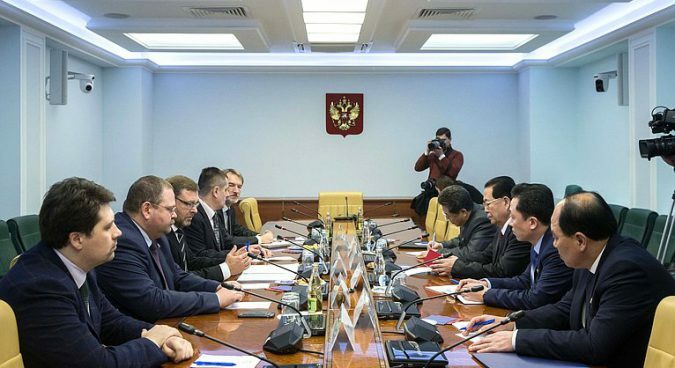 Back in Moscow, Kosachev and Ambassador Kim reportedly also discussed “prospects for the implementation of Russian-North Korean economic projects” as well as intergovernmental committee meetings on trade and cooperation set for March in Moscow. Kosachev praised the “regular and informative” DPRK-Russia interactions as of late, saying it is “due to the intensification of inter-parliamentary visits and the activity of friendship groups,” in part, according to the Federation Council report. The 9th Meeting of the DPRK-Russian Intergovernmental Committee (IGC) for Cooperation in Trade, Economics, Science and Technology will kick off March 6, and is expected to make progress on a cross-border road bridge and “trading house” for North Korean goods headquartered in Vladivostok. And as Russia continues to display a desire to stay involved and relevant in North Korea’s development, it has also been busy in recent days coordinating with other countries over the denuclearization process and plans for a U.S.-DPRK summit later this month. Deputy minister Igor Morgulov met with his Chinese counterpart Kong Xuanyou on Monday to “coordinate further joint steps on a settlement track” for the situation on the Korean peninsula, the Russian foreign ministry announced. Morgulov also met U.S. Special Envoy for North Korea Mark Lambert on Monday, along with Russian ambassador-at-large for nuclear affairs Oleg Burmistrov, the U.S. embassy in Moscow said in a press release. The two sides reportedly discussed denuclearization as well as further coordination in the negotiations process.